Mass march in Gaza declares: Donald Trump, US imperialism not welcome in Palestine! | Fight Back! Mass march in Gaza declares: Donald Trump, US imperialism not welcome in Palestine! Fight Back News Service is circulating the following May 23 account by the Popular Front for the Liberation of Palestine (PFLP), of the massive anti-Trump protest in Gaza. 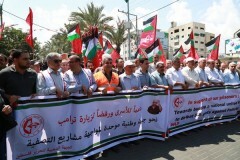 The Popular Front for the Liberation of Palestine organized a mass march and rally in Gaza City on Tuesday, May 23, from Palestine Square to the prisoners’ support tent for the hunger strike, in rejection of the visit of the war criminal, US President Donald Trump, in our occupied homeland Palestine. Thousands of comrades, leaders, representatives of national and Islamic forces and of the Front, led by members of the Political Bureau, the cadres of the Progressive Student Labor Front and the Union of Progressive Palestinian Youth, marched, carrying banners and signs in support of prisoners and condemning the visit of Trump to occupied Palestine. Marchers set photos and an effigy of Trump on fire, challenging U.S. imperialism, and rejecting U.S. attempts to brand resistance as terrorism. 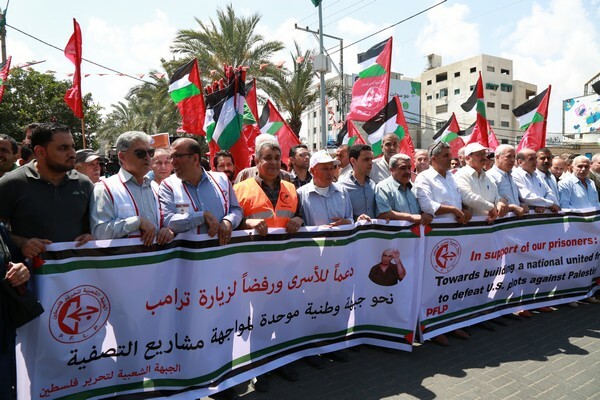 Comrade Hani Thawabteh spoke at the march, in which he emphasized the support of the Palestinian people for the struggle of the Palestinian prisoners and complete rejection of schemes that aim to liquidate the Palestinian cause. He saluted all of the prisoners on their 37th day of hunger strike, armed only with their will and determination to confront the Zionist occupation on the front lines of resistance. He further noted that the Trump visit to the region is part of the consistent approach of U.S. imperialism toward maintaining the security of the Zionist entity with the support of the thrones of Arab reactionary regimes acting as agents of imperialism and Zionism in the region. Thawabteh emphasized the importance of confronting American and Zionist schemes against the Palestinian cause, including an “Oslo 2” project that aims to liquidate the right of return, suppress the resistance and create a self-rule pseudo-government that is a mere security guard for the occupation. “In the name of Palestine, our people and our prisoners, we say that U.S. President Donald Trump represents evil and terrorism in the world. You are persona non grata in our county, Palestine!” Thawabteh said. He denounced the attempts by Trump and reactionary Arab regimes to label Iran, Hezbollah and Hamas as “terrorist”, calling this a “malicious attempt to distort the facts and target the resistance.” He said that the Arab nation will rise up and confront the reactionary regimes that plunder the fortunes of the people and perform marketing services to normalize the Zionist ane imperialist project in the region. Thawabteh also expressed confidence in the coming victory of the prisoners, emphasizing that such a victory will be a source of great momentum for the Palestinian people in confronting all schemes and liquidationist projects. He declared that the Front remains faithful to its principles and will continue to confront all conspirators against the Palestinian people and their resistance, including imperialism, Zionism and reactionary Arab regimes, in order to defeat the occupier and liberate the entire land of Palestine.